And the Dense, or Stupid Fog, brought out “DENSE” or STOOOOOOOPID drivers! Like the lady in the black SUV we came across on I-376 West near Greentree. There had just been an accident in the right lane. This was obvious from the police cars driving up the shoulder of the road AND the flashing emergency lights of the police cars already at the accident blocking traffic and guiding all cars to the left lane. Seeing that, I decide to put on my left turn signal, scoot gently toward the left lane, into a slight traffic gap and a lady in a black SUV darts forward in the left lane, gives me a horn, yells some stuff and edges me out as if I was trying to jump in front of her for the last WARM loaf of Mancini Bread at the grocery store in the morning!!! As I looked over, I could tell she had NO CLUE what was going on 100 feet ahead because she was looking down at the phone in her hand while she was edging forward. To be clear, the ONLY reason why that lady’s close-up picture is not plastered all over this website and our Facebook and Twitter pages, is because I didn’t have my own phone in my hand OR Marc-Andre-Fleur-like-reflexes to grap it while I was trying to merge!!!!! Hey Dense-Foghorn-Leghorns (See what I just did right there? ), like the reflectors on your old banana-seat-bicycle-with-the-5-foot-high-sissy-bar-and-the-baseball-card-in-the-spokes, the headlights on your car are a SAFETY DEVICE. And boy, I say boy, I say…. (see what we did there with the Foghorn Leghorn imitation? 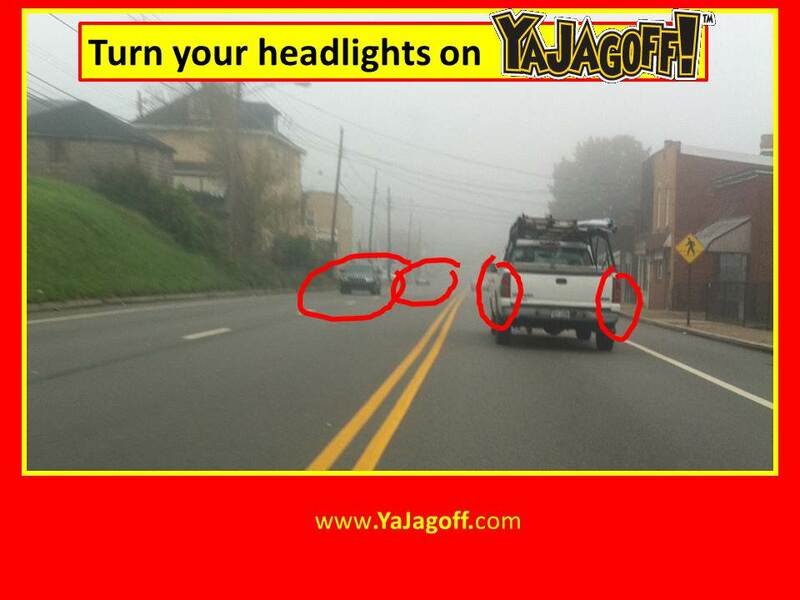 ), feel free to turn those SAFETY DEVICES on so the REST of us can see your other bad driving habits a little easier in the fog and rain, YA JAGOFFS!!!! Want the pic below as your smart phone screensaver?? Click it and see how to download it for free! Next articleHow Is The iPhone 5 Owner Like a Pittsburgh Airport Baggage Claimer?